At a dinner party recently my friend James mentioned that he had synesthesia -- something I had never heard of. He explained that since childhood he had seen numbers and letters as specific colors. For James, 1 is always white, 2 is always yellow, A is apricot, B is blue, and so forth. Synesthesia, he explained, is when two or more sensory areas of the brain cross-connect. You either have synesthesia or you don't -- it is not a learned ability. James is an artist so I wanted to know if this phenomenon in any way manifested itself in his paintings. He said it didn't, but it did help him remember telephone numbers -- he could see and read the sequence of numbers as colors -- a very different experience than say, rote memorization or deliberately assigning specific colors to numbers to use as a mnemonic device. He says it also useful to him by setting "a nonverbal emotional tone to the simplest of thoughts." I was intrigued and more than a little jealous of James's exotic ability, which I clearly did not possess. The next day, I started researching and soon learned that synesthesia can manifest as a crossing of any two or more senses. Some synesthetes taste sounds, some see music, some can see and feel tastes, and some have combinations of three or four senses simultaneously. In my research I came across a diagram of a "spatial sequential" synesthesia depicting the months of the year as an oval-like shape, and realized that I actually did have this particular type of synesthesia. I have always known which month of the year we are in by its location on my own idiosyncratic shape and its relationship to my body. I've seen the calendar this way since I was a child and never thought it was anything special or even worth mentioning. 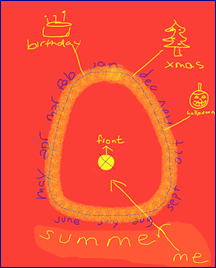 Below is a rough two dimensional sketch of my calendar that I did on my iPad. The colors in the sketch don't mean anything (I just like them). Neurologist and researcher Richard Cytowic, also stumbled on the phenomenon at a dinner party many years ago. His host that evening apologized that there weren't "enough points on the chicken." When Cytowic asked him what he meant, his host explained that when he tasted something intense, the feeling would sweep down his arm into hand where he felt a shape, weight, texture and temperature. He had wanted the chicken to be a prickly, pointed sensation, but it came out "all round." This chance encounter lead to the research that resulted in Cytowic's two books on the subject: The Man Who Tasted Shapes, and Wednesday Is Indigo Blue: Discovering the Brain of Synesthesia (co-authored with David M. Eagleman), both concerning the research and experimentation that has led to synesthesia being taken seriously. It was ignored for many years because of a lack of scientific data. Brain scans have definitively proven that more than one sensory area of the brain simultaneously lights up when synesthesia is experienced. These findings, and others, have changed the way scientists think about the brain and how we perceive the world. Research also shows that synesthesia tends to run in families and is an inherited trait. However, the connections that are formed -- for instance in my friend James's case, where 2 is always yellow -- happen in early childhood and become fixed for life. Even identical twin synesthetes will have different associations for the same number or letter. The following video is of a lecture Cytowic gave at the Hirshhorn Museum in conjunction with its exhibition "Visual Music," featuring music-inspired art. Some of the artists in the exhibit, most notedly Kandinsky, were synesthetes and painted what they saw, while others, such as Georgia O'Keefe, did not have this ability and instead consciously translated the music. If you would like to know if you have synesthesia, there is a research website, The Synesthesia Battery, that allows you to test yourself. If you are synesthetic, I would love to hear about your experiences in the comments section below. Offramp Gallery is pleased to present a solo exhibition, Theodore Svenningsen: Truth and Self Deception from February 20 - March 20, 2011. There will be a closing reception and artist's talk on Sunday, March 20, from 2-5pm. Click here to read review in ArtScene. In Svenningsen's text pieces the work exists at a place where narrative meanings of words can give way to being seen solely as aesthetic objects. The work explores this conflation of the narrative and the aesthetic. Some of the pieces are self-referential. These pieces investigate, critically, the underpinnings of theory-driven art. Some explore the interrelationships between individual persons and the larger group, and look at the difficulties and inabilities of these certain individuals to fit in. Logic symbolism forms the bases of the aesthetic element in a number of the pieces. Click here to purchase products from the Offramp Gallery Blog Store. Awesome insights on synesthesia. One of m favorite things to do is sit back and watch these guys talk about the condition and all of the research that is being done to further our knowledge. The website that I linked has some great videos of Dr. Jamie Ward discussing different aspects of synesthesia. Those are some of my favorite.